Here are my favorite Small Bathroom Ideas to help you get the most out of your tiny space. Choosing a small bathroom design and function for your entire family can be both daunting and exciting. Whether you’re revamping your old bathroom or going for an entirely new small bathroom design, there is a lot you have to think about. But worry not, I’ve put together the best time-tested idea guide for your next small bathroom makeover. As you read through the sections below, you will discover tons of brilliant ideas and tips that will help you plan the best ways to go about your update. 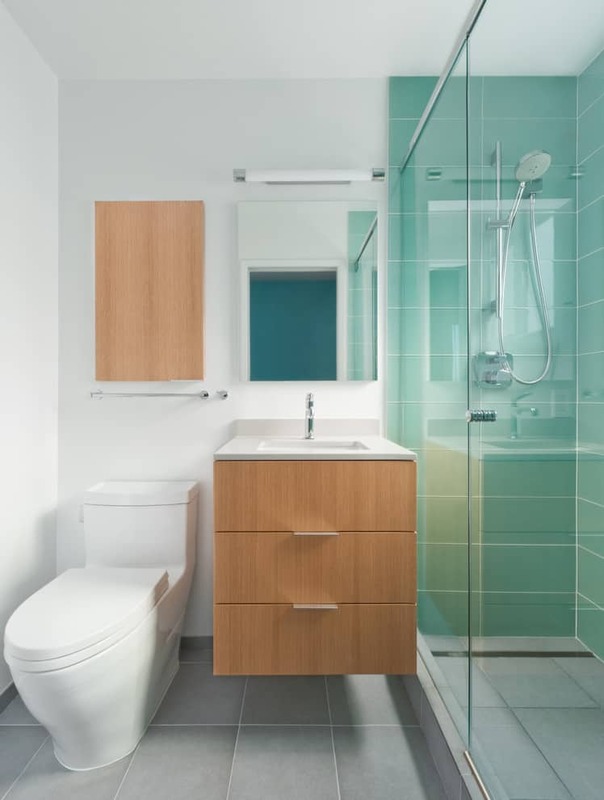 From deciding how and where to start to find all the answers you need when looking to maximize space and make your small bathroom look roomier, it’s all here. 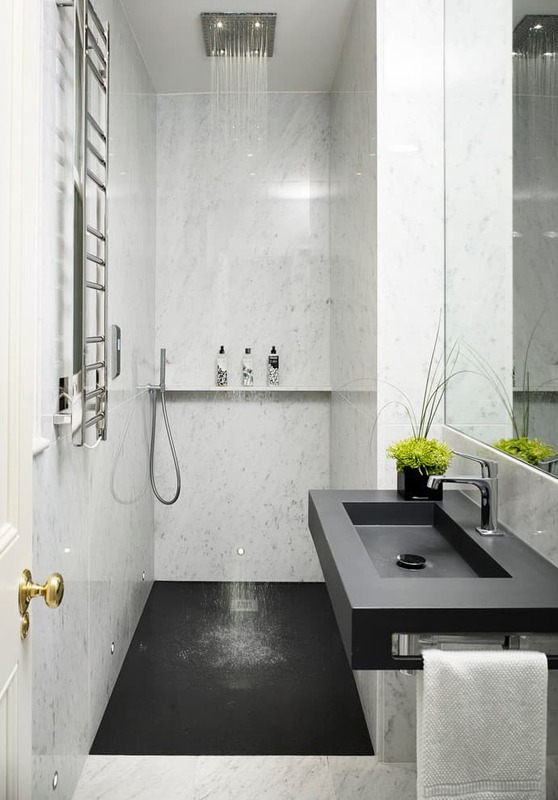 A bathroom, no matter its size, should be a retreat for contemplation, luxury, comfort, and functionality. Regardless if you call it a bathroom, restroom, wet room, en-suite, or powder room, this is one of the few rooms in a house where you can enjoy complete privacy and solitude. Not a problem if you have a spacious bathroom but for many, the challenge is finding adaptable small bathroom ideas and designs that are affordable and unique while providing you with enough room for storage and enough space to move freely. There are lots of tricks you can use to create the illusion of more space without sacrificing function or style. Here are my top tricks. Think of lighting that can add soulful warmth to your small space. Use a play of light with the wall colors to create more space than actually is in the area. Soft white lights can also be used to create an illusion of space. LED lights in negative detailing help flood a wall or an accessory to create interest and texture. This can take away focus from the small space and add depth. By making sure that every corner of the bathroom is well-lit, you expand your limited space making the bathroom look larger than it really is. You can work with natural or artificial light; it doesn’t matter as long as it is the kind of lighting you like. Just make sure any additional lights you install are approved for use in the bathroom and the electrical set-up is done by a professional. Also, consider getting focused spotlights that target specific areas in the bathroom for showering, styling, dressing, and for adding to the illusion of space. Vary the size of the tiles to highlight the architectural details of the room. 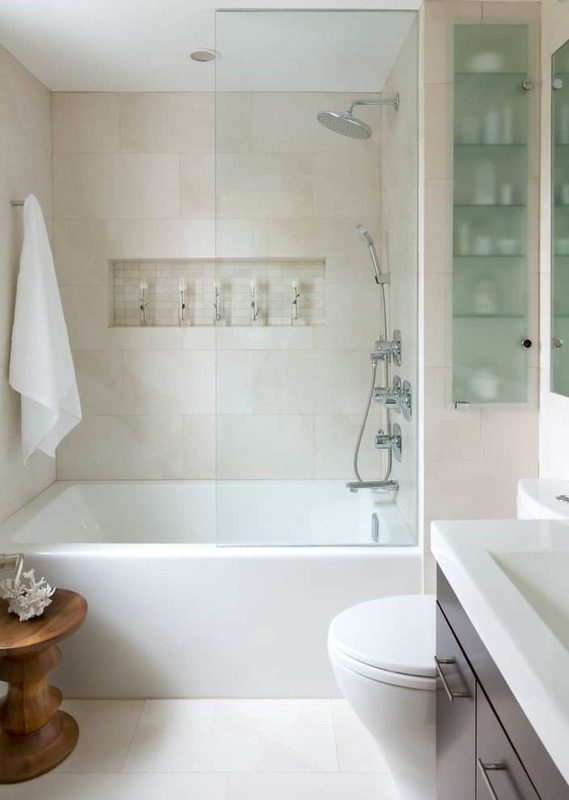 Using light colored tiles (think white, beige or gray) is a crucial small bathroom flooring idea that helps enhance the space by reflecting light falling on it. You can also try glass tiles to add a bright focal point to an otherwise dark and crowded space; this creates the illusion of elegance, luxury, and space. One of my favorite space-saving small bathroom ideas is to have a bi-fold door or a sliding door instead of the traditional swinging door. 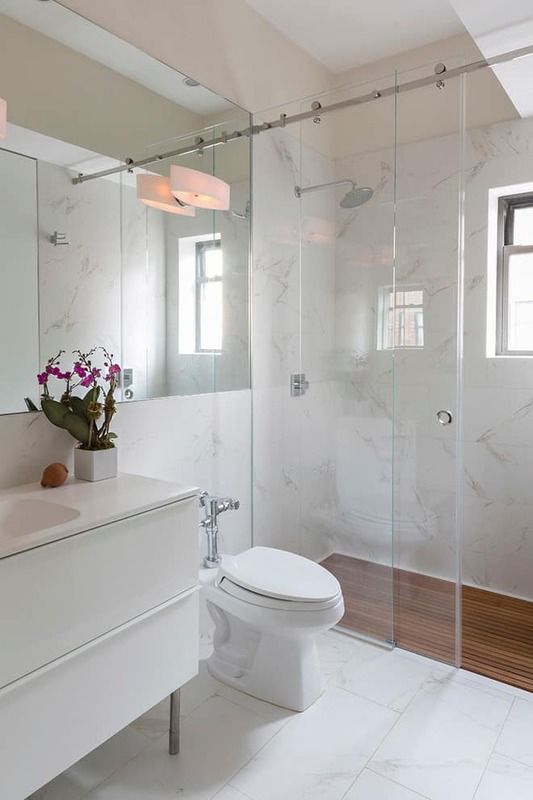 If you use a frosted glass panel pocket door, it will give your privacy so the bathroom can be used by someone else, while another person bathes. Open shelf cabinetry is best for allowing you to store and display plenty of personal items like towels, cosmetics, etc. 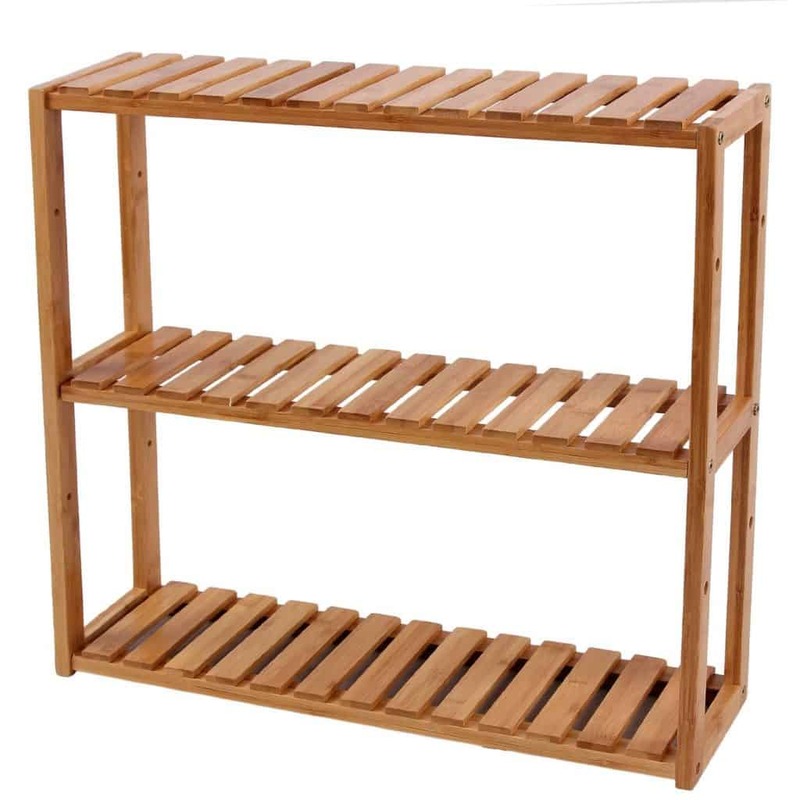 You can use wooden baskets or plastic bins to organize things in your open shelves neatly. Keep in mind that open shelves negate the need for cabinets, but while removing furniture is a good idea, if you leave an empty space behind, it will look unfinished. 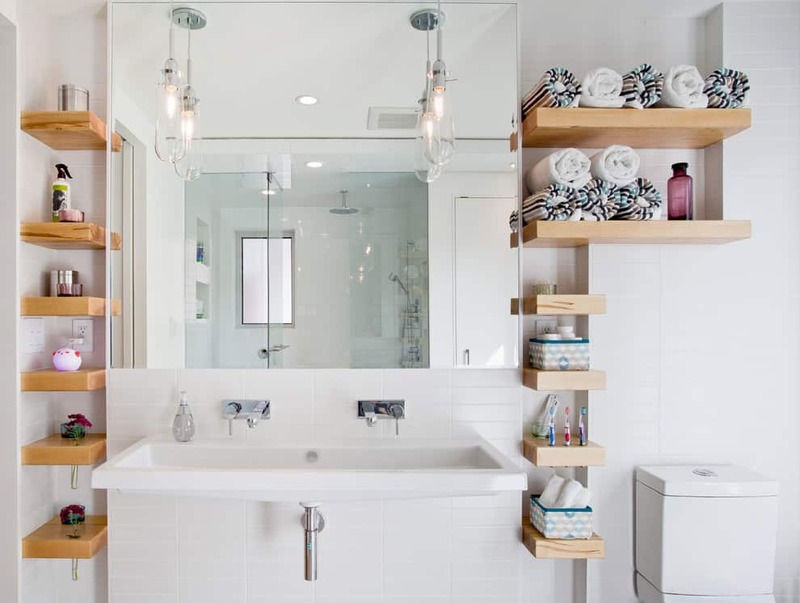 Replace the lost storage space with open shelves which should prompt you to keep everything organized and neat, and you can also enjoy more floor space for an assortment of candles for the times when you need to relax and escape the harsh bathroom lights. 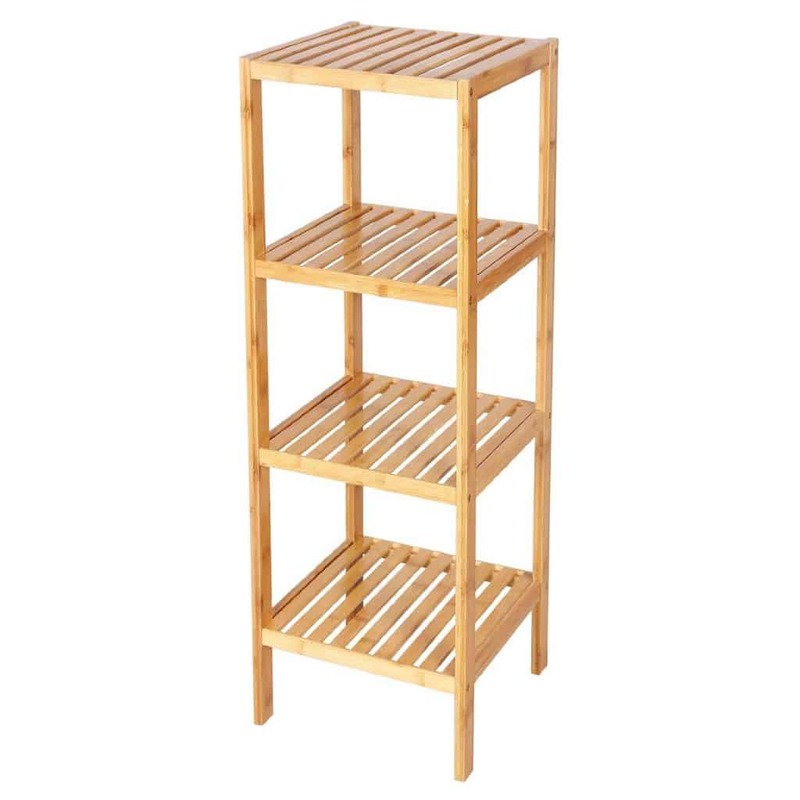 Also, you don’t have to settle for the traditional open shelves, be creative and arrange the shelves decoratively. You can look at open shelves meant for living rooms or bedrooms, refurbished crates, or baskets that are hung sideways. You have a choice of a flat mirror or a mirror cabinet. If you choose the flat mirror, consider a large mirror behind the sink that doesn’t cut at the waist or chest but drops down to the floor. You can also put the mirror behind a light or opposite a window or even in the shower. Many people see have just a shower as a step back from having a luxury bath compared to the inclusion of bathtub, but if you invest in a modern shower system, you get a massage every time you step inside or a waterfall shower with heated tiles. You can even add some soothing warm neon lights inside the shower if you want to add some romance or passion to the room. A great small bathroom shower idea is to change your shower enclosure to glass or see-thru material rather than tile or cement walls. 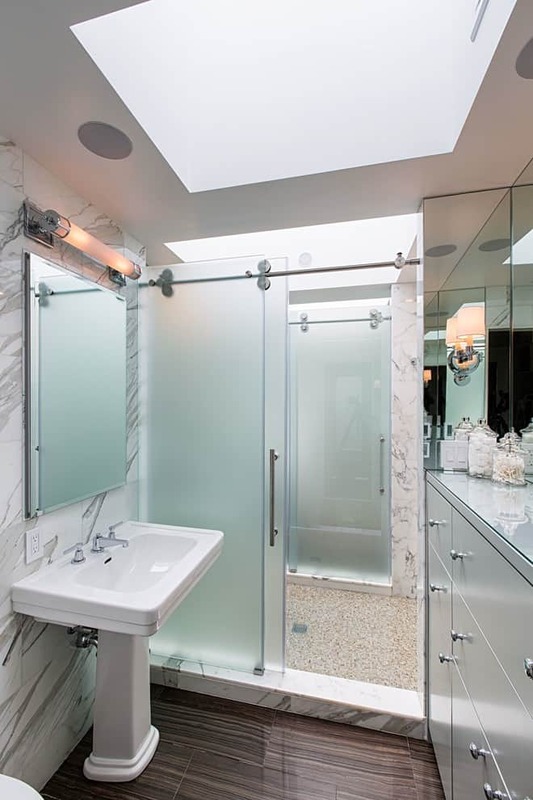 You can even go one step further by getting the shower enclosures that do not have the aluminum support that runs the full length but have holders in strategic places which lends a more muted look and does not break the flow of light and sight. Who says you have to buy a standard sink? 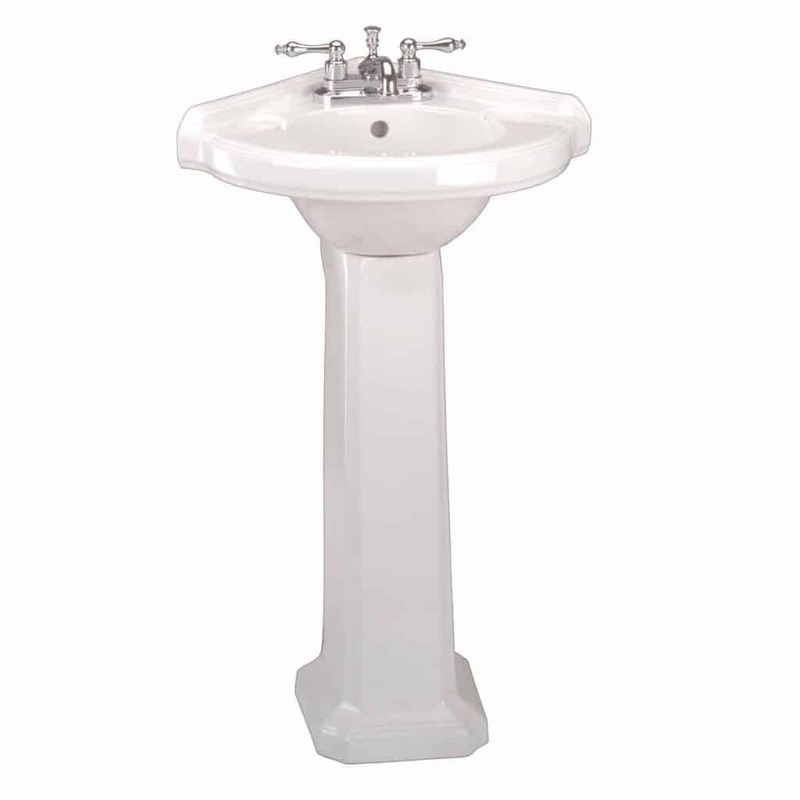 There are tons of different sink sizes from narrow and elongated to short and stubby. There are also smaller-sized toilets that you can get to increase your floor space. Traditional sinks can end up taking a lot of room in a pint-sized room. 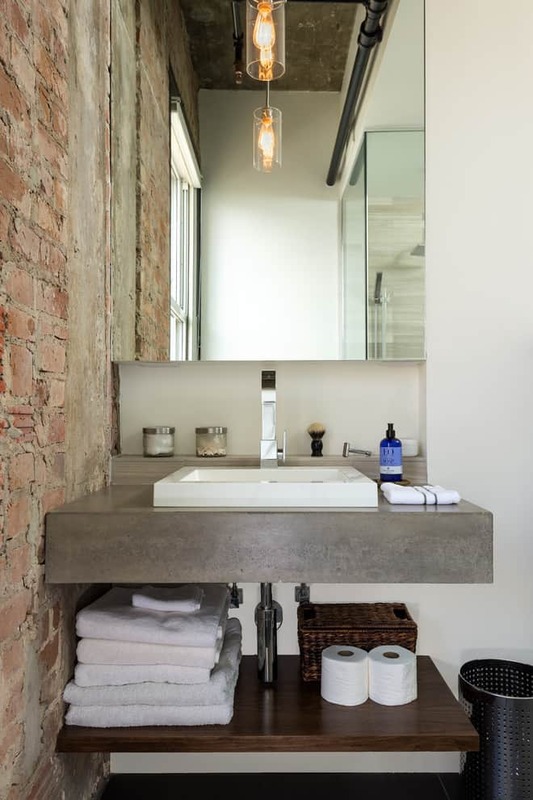 So go for a pedestal sink or a wall-mounted sink to allow natural light and maintain a feeling of open space. If you can’t do a glass shower enclosure and have to use a shower curtain, then raise the height of the curtain rod as high as possible. This will make the room seem taller and elongate the room. If you have windows with curtains, use tall narrow curtains to help lengthen the room. 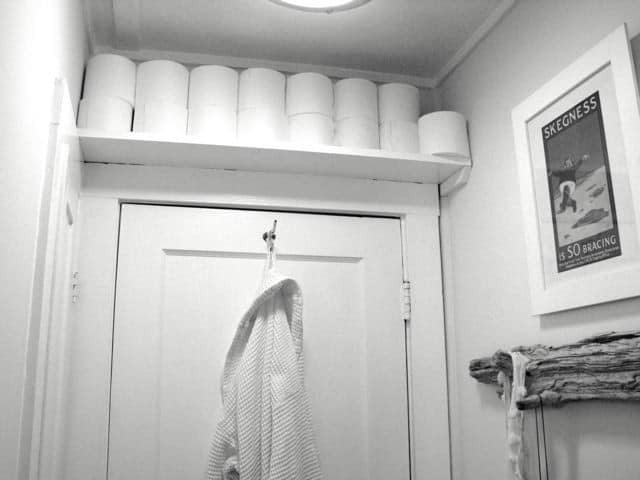 This is an extreme idea and only works if you have an adjacent laundry room to your small bathroom. Have you ever considered the idea of combining your laundry room and your bathroom? 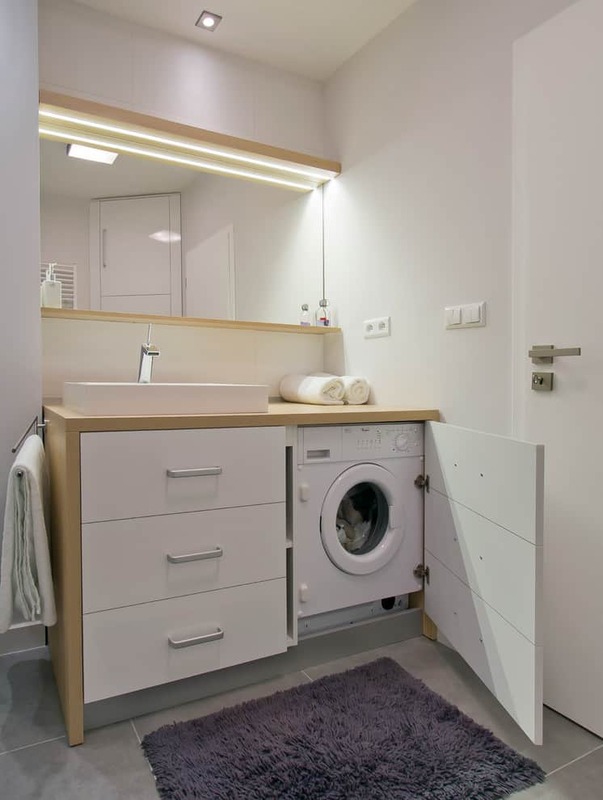 If you want, why not put the washer/dryer beneath your sink on inside a closet. This will allow you to break down a wall if the laundry room is beside the bathroom. Ultimately this will increase the size of the bathroom, though making it a dual-purpose room. Everything you don’t need, put it somewhere else or throw it away. If you haven’t used it in a year, toss it. 12. Store your bulk Costco toilet paper somewhere else. If you’re the type to buy wholesale shampoo, soap, toilet paper, that’s great and smart financing, but you should also invest in smaller-sized bottles and simply refill to keep the bulky bottles out of your small bathroom. Using paint to make your small bathroom feel bigger is the easiest trick to them all. Because the bathroom is small, you can do it quickly, and paint won’t be expensive because you won’t need much of it. 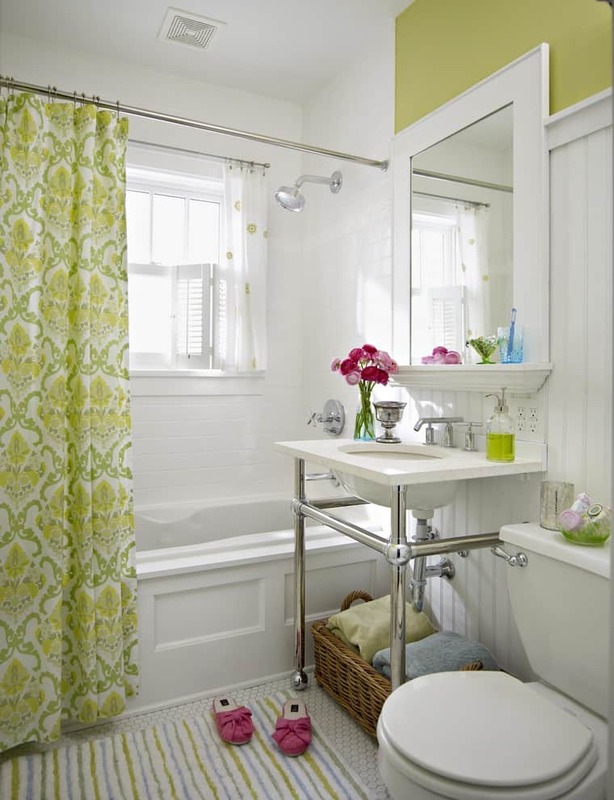 Using lighter and brighter colors will make the bathroom seem larger. Use light colors on your door, windows, and trim too. It doesn’t have to be just white, white, and more white. 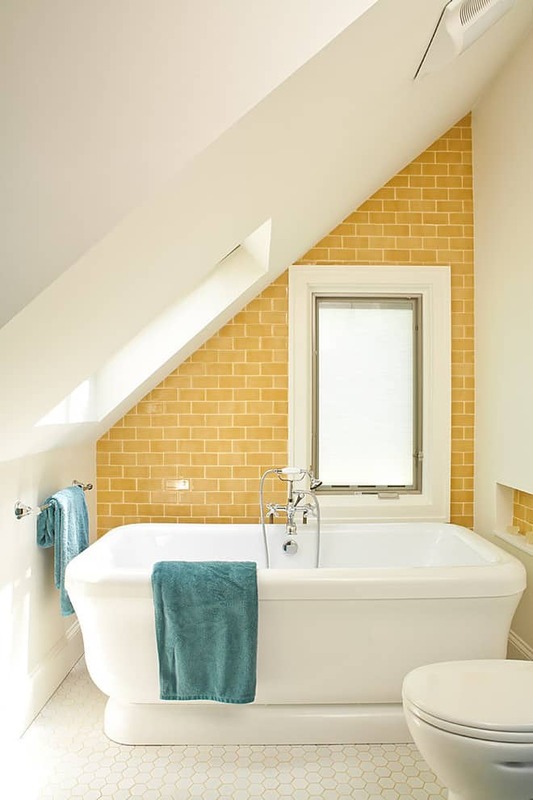 You can use bright yellows, oranges, greens, and blues as accents or focal points in the bathroom. Personality is what you should be concentrating on as you pick out your small bathroom’s accessories. From lighting to fittings, everything should be about you and what you like. The bathroom is the most private room in a house because it has limited space, windows (usually covered with blinds or curtains), and only one door. The idea is that when you enter your bathroom, you are entirely comfortable and safe. Below, I have listed out are some excellent point-by-point small bathroom ideas you might want to consider. If you want to challenge tradition, there is absolutely nothing wrong with using different, uncommon colors. You can use color, texture, and patterns to showcase your personality and add some flare. If you opt for a simple base with accents on the walls and floor, you can create drama and flair. Your color palette should give to a sense of connection with the room while giving you a profound sense of satisfaction and well-being. Keep in mind that paint can be customized to your preference, so if the shade of blue is too dark, you can talk to your local paint store to mix you a particular order of the shade you want. 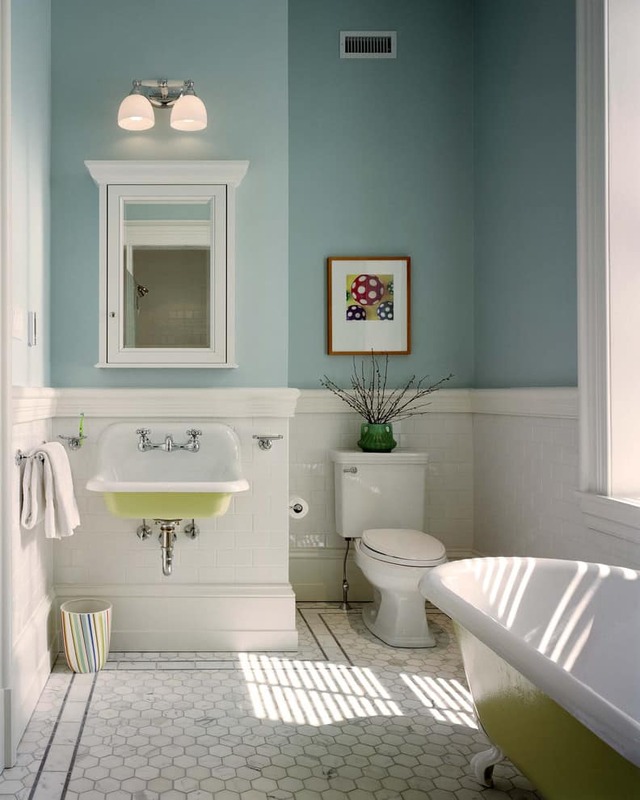 Design experts are using shades of gray, blue and beige rather than the traditional all-white look for small bathrooms. For walls, I see lots of beautiful creative wallpaper or artsy decals. There are amazing designs like a tree decal over your toilet bowl or sink, 3D butterflies hovering over your bathtub, geometric decal designs, Asian-inspired self-adhesive wallpaper – the choices are limitless! The more complicated the walls are, the smaller the bathroom will look. If you use texture or patterns to add more flavor to your walls, make sure to pick a warm neutral base color for depth to avoid the complexity of too much going on and the sense of smallness. Redesigning a small bathroom to create more space requires a marriage of form and function, aesthetics and comfort. Vanities in a small bathroom can play a huge role in this aspect. 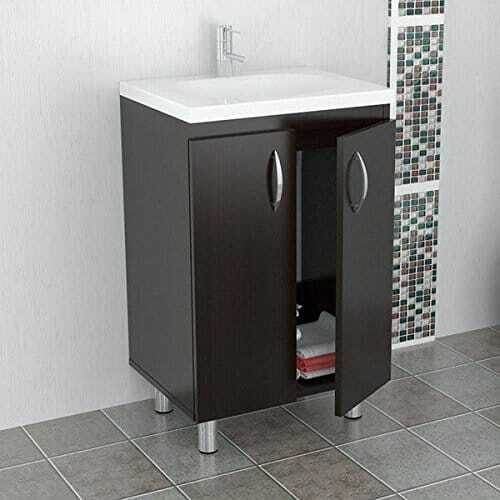 These days, you can easily buy ready-made vanity pieces explicitly designed for small bathrooms. Alternatively, you can go for custom-built vanities to fit the space correctly. 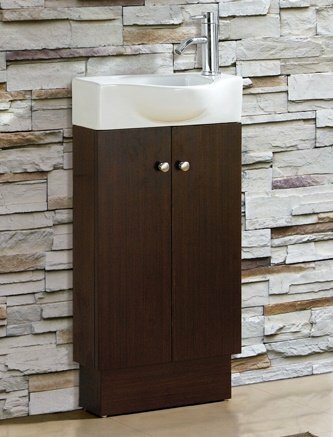 One of the best small bathroom vanity styles is the wall-mounted style which can gracefully maximize small space. 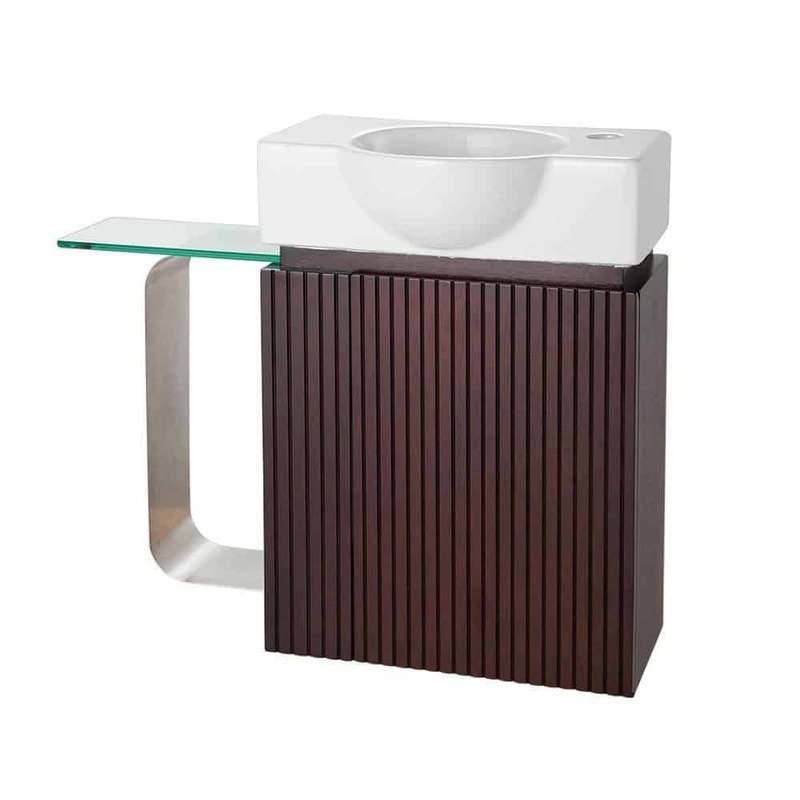 As I mentioned above, you can choose pedestal or wall hung sinks with a vanity to create the illusion of more space. Another idea you can implement is to select mirrored cabinets. These will give you much needed extra storage and also serve a dual function to accommodate your daily beautifying rituals of glamorizing yourself. Cabinet-style vanity designs come with traditional drawers or doors-and-drawers styles. The drawers could be small or deep for storing larger shampoo bottles as well as towels and other linens. Concealed compartments provide space and generous storage for smaller bathrooms. Add cabinets both below and above a sink to be used for storing razors, toothbrushes, medicines, cleaning supplies, etc. A beautiful mirror can be added to the small cabinet above the pedestal sink. Do not forget the space above and behind the toilet. You can add cabinet there or even open shelves to store extra stuff. You can place small bathroom accessories like decorative bottles, frames to liven up the space or even add a plant or two to add some greenery. Spice racks are not just for the kitchen. You can add open spice-rack like cabinets in the small washroom to organize makeup and toiletries or even add small potted plants. A small cabinet can even be added above the door of the bathroom. You can organize stuff in small baskets and use this space to keep the extra soap, cleaning supplies, etc. A great small bathroom storage idea is adding a holder for the hair dryer just inside the door of the bathroom’s cabinet. If your under-the-sink cabinetry does not have shelves, add some baskets to hold bottles and supplies. This will significantly enhance the storage space and also make it more organized to find things faster. 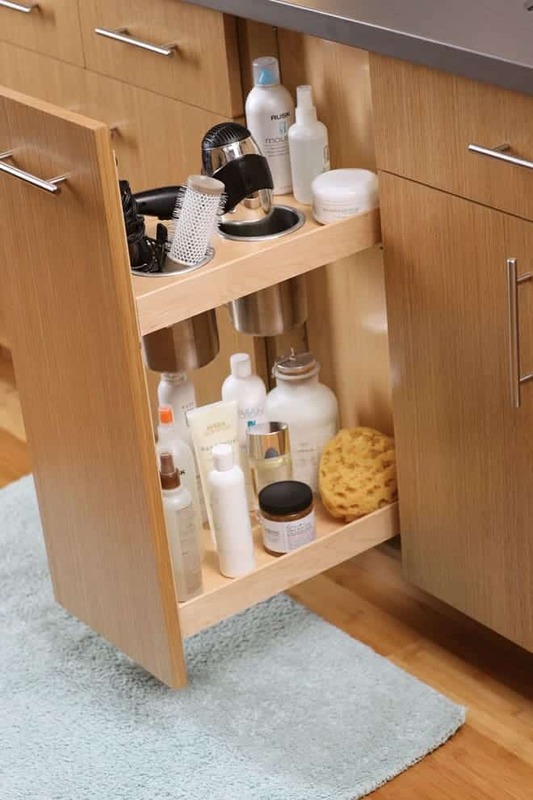 Another sneaky/creative idea for maximizing space in a cabinet is to add a lazy-susan. Not just for kitchens, it can hold bottles so you can easily find what you need. Small items become easily accessible when you can just spin them around, plus cats really like them too. 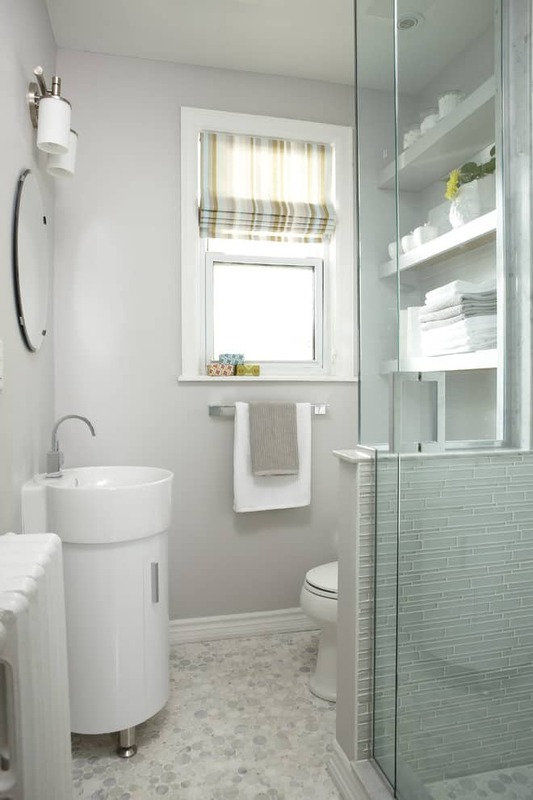 You can squeeze in a very narrow sliding shelf cabinet in the small space between the toilet and the bathroom’s wall. You will be surprised at how many things can be fit inside such narrow cabinets. 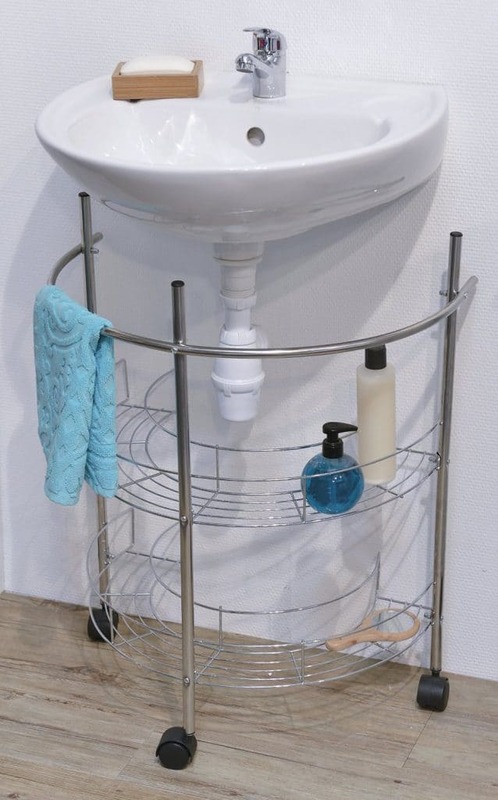 Small bathroom furniture can be creatively used to enhance storage space. 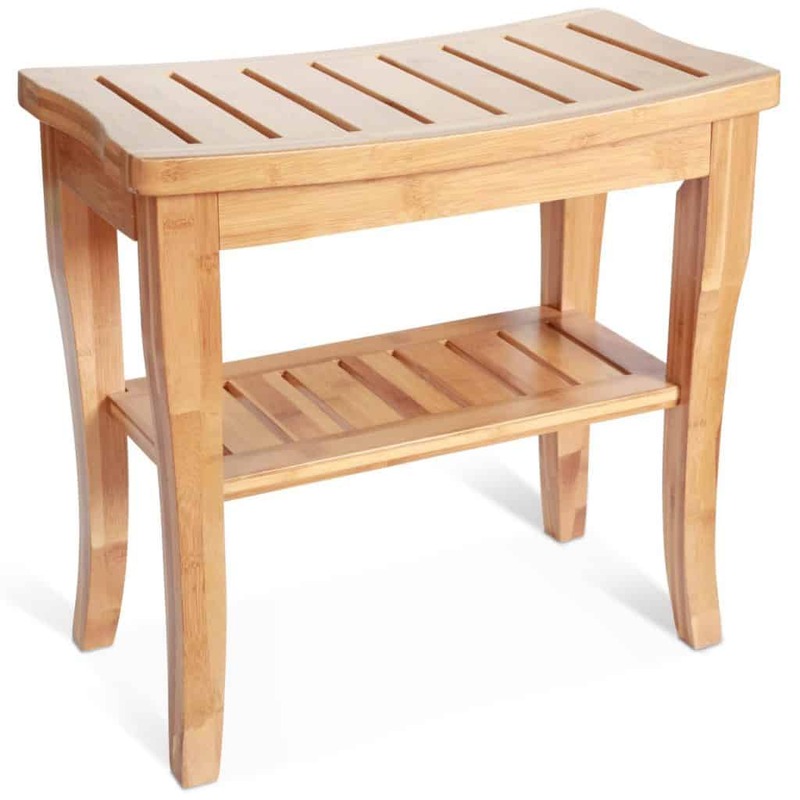 For tight spaces, it is smart to add legged furniture. Furniture with legs best suit an open design and create a visual impact while providing functional storage space for a small area. Instead of a single freestanding unit, go for several wall-mounted furniture units. Mounted units are ideal space savers for small bathrooms. 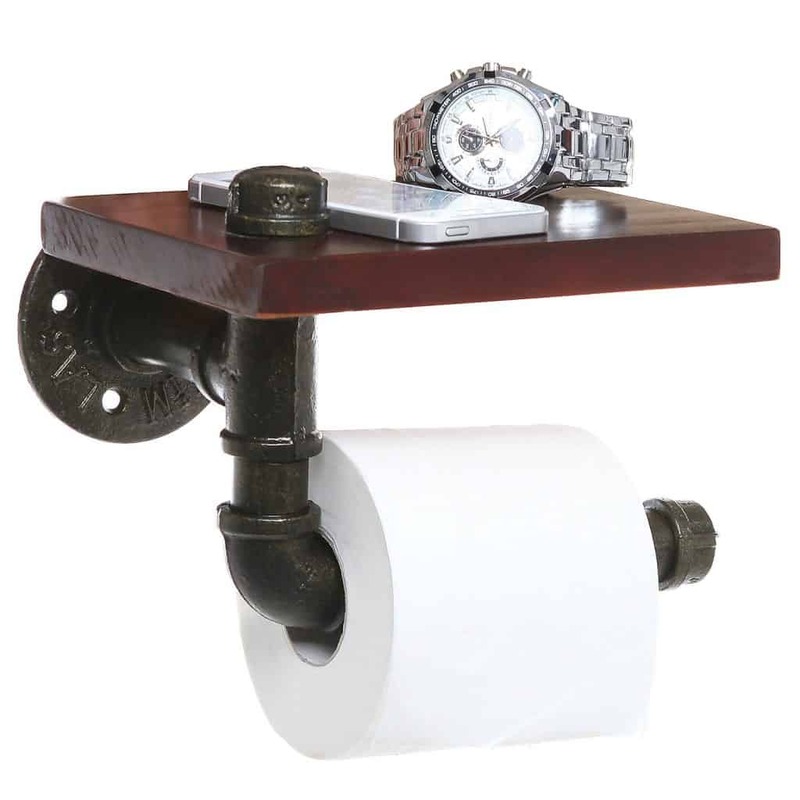 If mounting isn’t possible, then push all your small bathroom furniture as far as possible towards the walls. 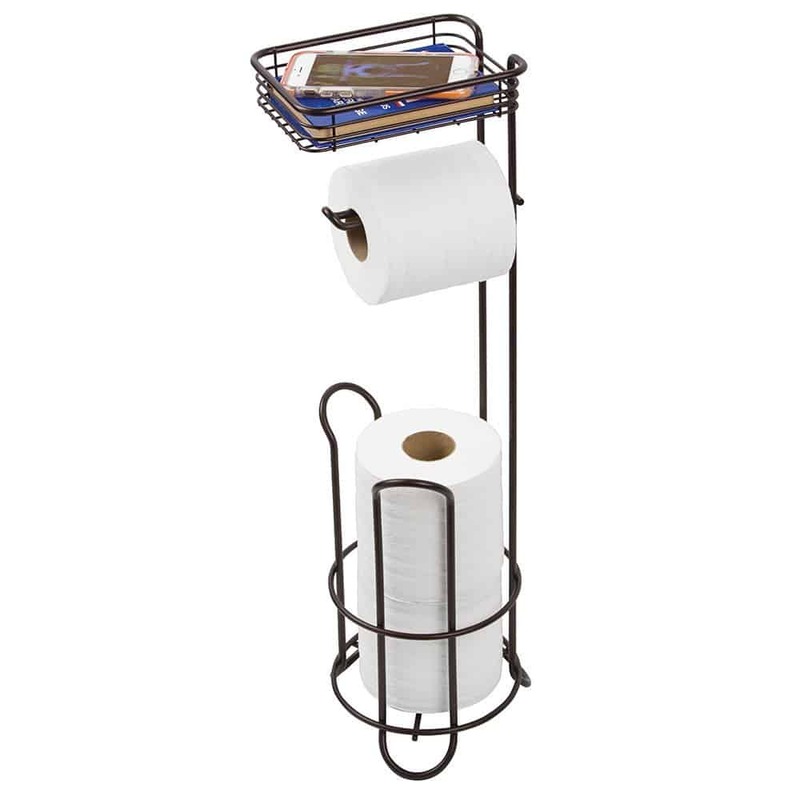 This will leave you with more precious room in the center of your small bathroom and free up floor space. Take a serious look at the walls and think about open shelving. Floating shelves will give you more space to add something whimsical like a vertical floor accent like a plant or narrow ladder for hanging clothes. If you don’t take tub baths at all (I haven’t touched my Jacuzzi tub in years), you can totally get rid of the tub and add a small shower cubicle instead. The remaining freed up space can be used up in many different ways such as for installing other small bathroom furniture pieces. Multi-functional wall-mounted pieces, (ex. Pieces that hover, or appear to, off the ground) suit the open design and visually add space to small areas. Buy lighter or white colored furniture. Bright pieces help reflect natural and artificial lights to prevent the already-cramped up bathroom from looking dark and crowded. Use for trim and lightweight bathroom furniture as against heavy storage units. Look for slender legs and compact vanities and cabinetry to suit the small room. Such pieces provide comfort and utility without giving a congested look. Make sure that the chosen bathroom furniture does not block your view. For example, if you have a shelving unit behind the toilet area, make sure its sides do not block your view from other cabinets or vanity as this can give a congested feel to the room. 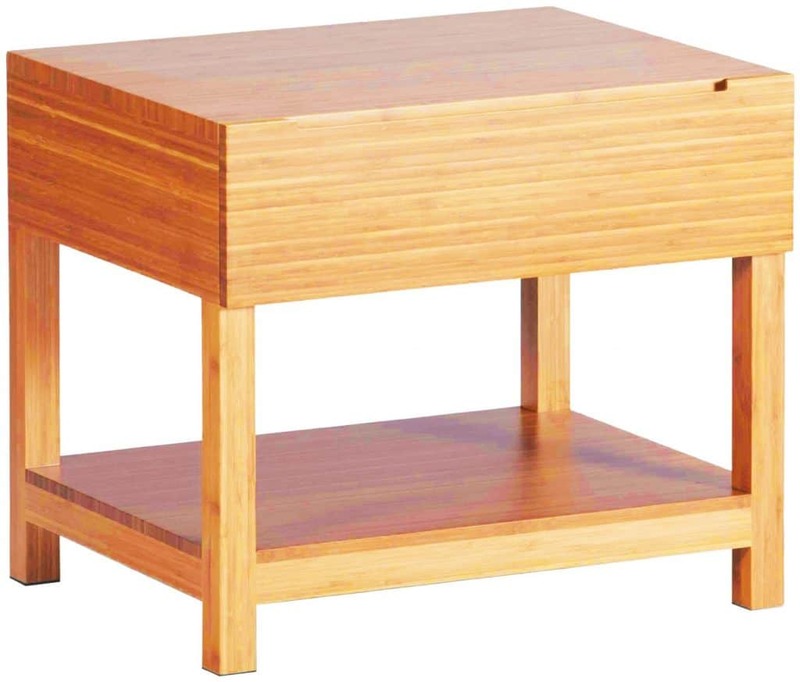 Consider furniture items made for the bedroom, kitchen, or living room! Yes, just because an item is labeled for another room, it doesn’t mean it won’t perform well in your bathroom. 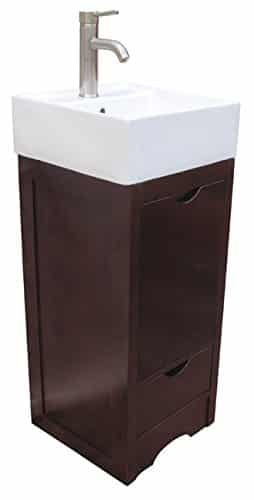 For example, a small bedside table made for your bedroom can actually make a great vanity in your small bathroom space. 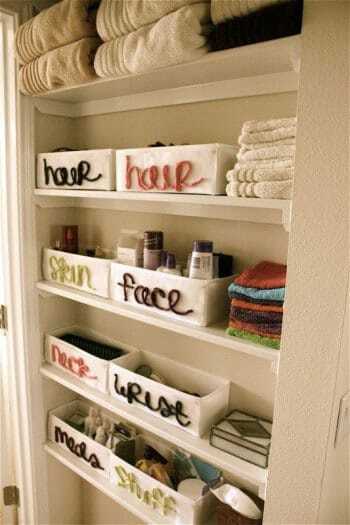 Frame the bathroom’s doorway with a shelf to hold toiletry items. Alternatively, instead of the entire doorway, you can add open shelves or small bathroom cabinets above the door to store tons of stuff. This will create smart storage solutions and also free up a lot of room in the bathroom. The bathroom’s ceiling is also usable. 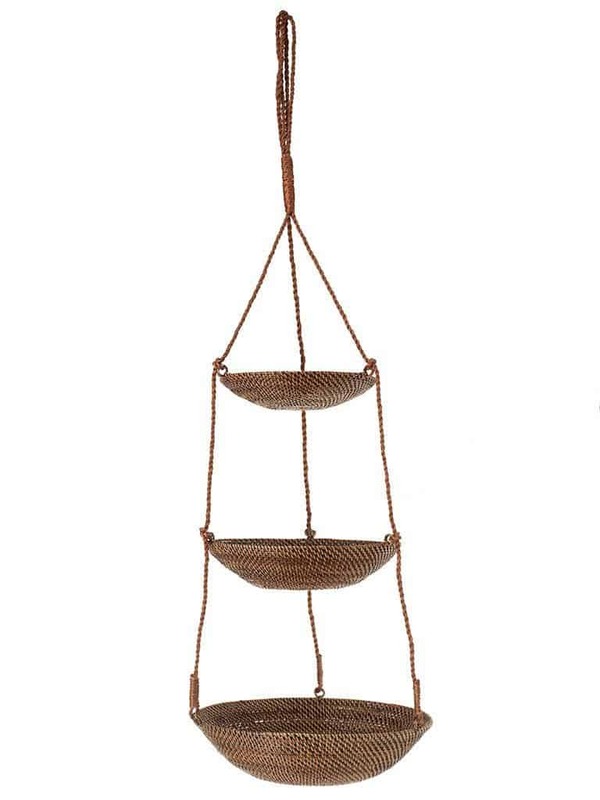 Use it to hang small baskets or hanging shelves which can hold bottles or a plant or two. Make sure that the hung objects do not harm the taller member’s in your family or vice versa. Hang baskets under your bathroom sink for additional storage space. 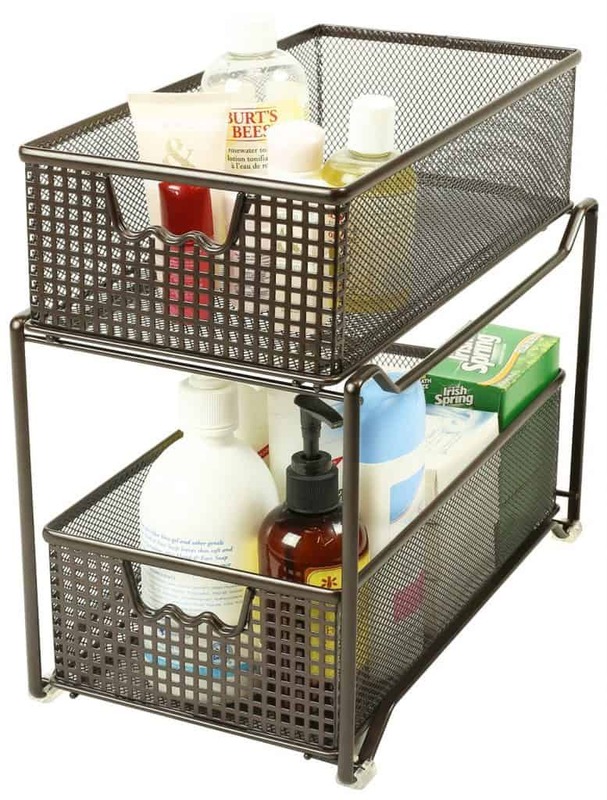 All you will need are some hooks (stainless steel or white) with baskets that have handles, and you’re set! If you love the idea of wall hangings, buy a hanging hamper instead of having the traditional hamper that takes up precious floor space. Maximize your bathroom’s wall space by creating a niche in the walls. Every 16 inches there is a gap between the studs in your drywall, you (or a highly skilled strapping young carpenter) can cut out some holes in the walls and frame out and finish those hidden spaces into countless shelving/storage possibilities. Just watch out for wires. These new spaces can be used for storing things in an organized manner. You can add small baskets or boxes for further segregating items. 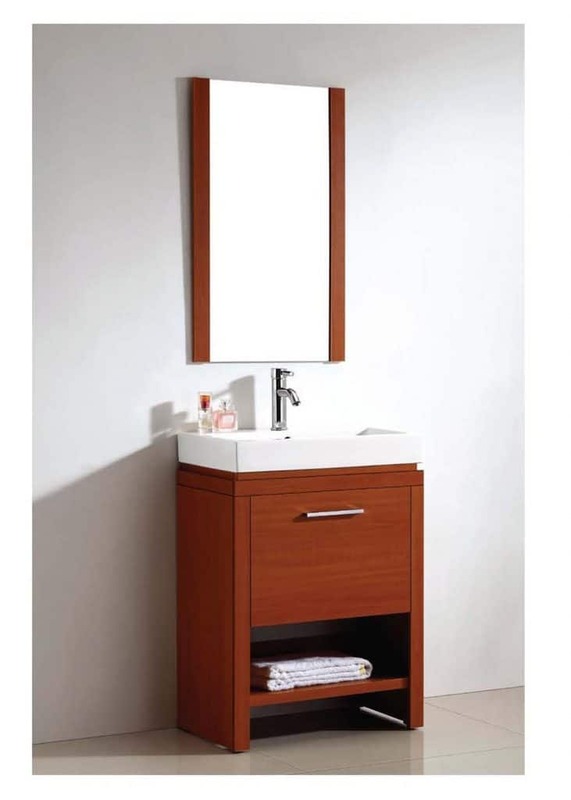 Put your small bathroom’s furniture to work by installing multipurpose units. 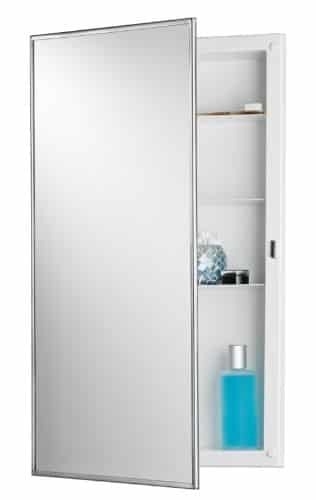 For example, your mirror can hide a small cabinet behind it for keeping medicine, brushes, etc. and you could also have a small rack just beneath the mirror in the front to hold the items you need daily. 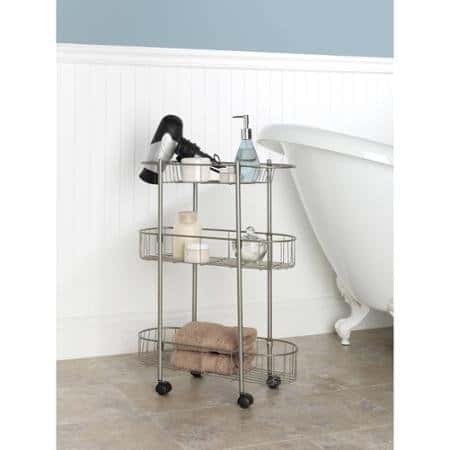 This will significantly increase your small bathroom storage space. Forget about storing cleaning supplies in the bathroom. If you have a small bathroom, chances are you also have limited living space so doubling up on your cleaning supplies is not necessary. The same applies for a supply of toiletries and towels. Store these away in your bedroom or outside the bathroom in a convenient cabinet. This will free up space beneath the sink, make it possible to remove unnecessary bulky towel racks which you can replace with something that will not use up as much space. Have an extra curtain rod? Buy an extra curtain rod to place on the opposite side of the shower which you can use to hang small plastic baskets for shampoo and other bath essentials. You can even have one basket for every person who uses the shower if you’re into extreme hygiene. Just be careful about the weight of each basket so you don’t stress the curtain rod. If you are tiling a small bathroom, many small bathroom flooring ideas can give a spa-like feel and create a cozy personal space. You can go for continuous tiling in natural stone. Stone is one of the best small bathroom flooring materials as it gives a dynamically airy feel to otherwise congested-spaces. Neutral or natural colored stone, like those having small specks of color, can also add some color to otherwise neutral spaces. You can also enhance the color scheme through colorful bathroom accessories like towels, bottles, toothbrush holders, etc. Read more about Bathroom Tile Ideas. 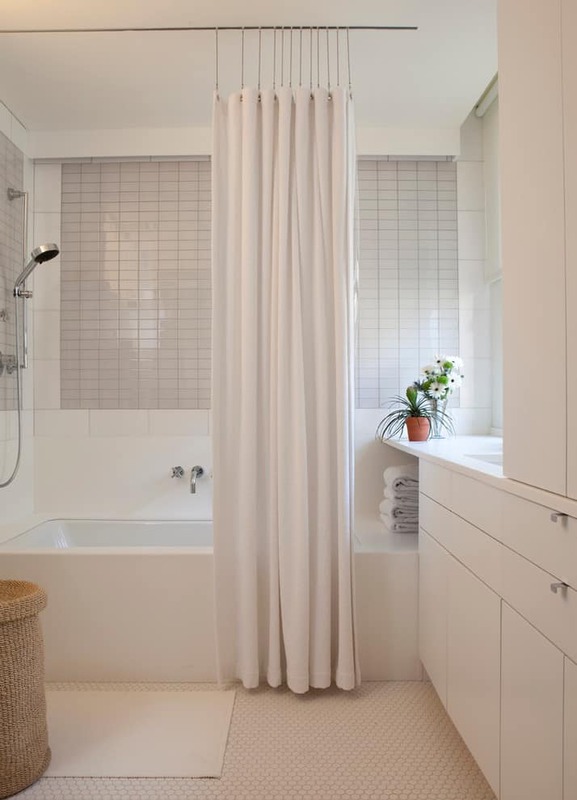 A walk-in shower is the best way to make a small bathroom roomier. It can provide walls to hold mounted vanities and accessories. 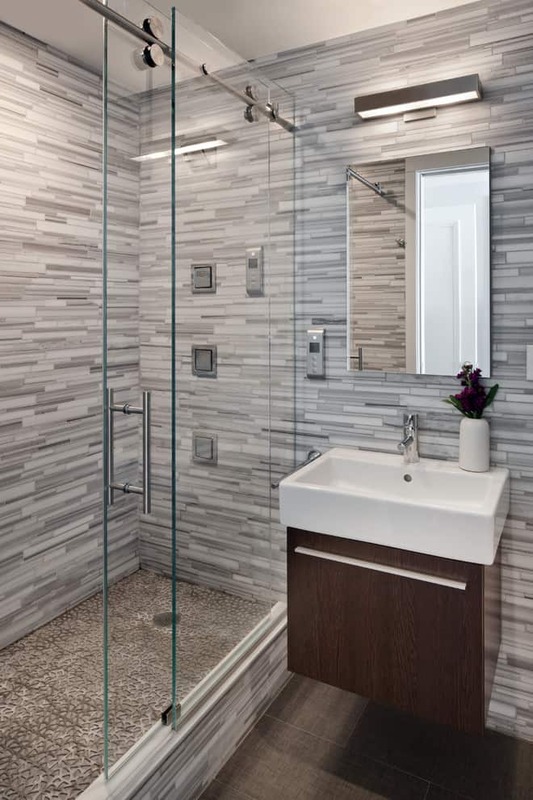 If you opt for a custom shower rather than a one-piece fiberglass stall, then be sure to use white and neutral colored tiles having reflective surfaces to encourage light to move around – this will make the crowded spaces look more open. 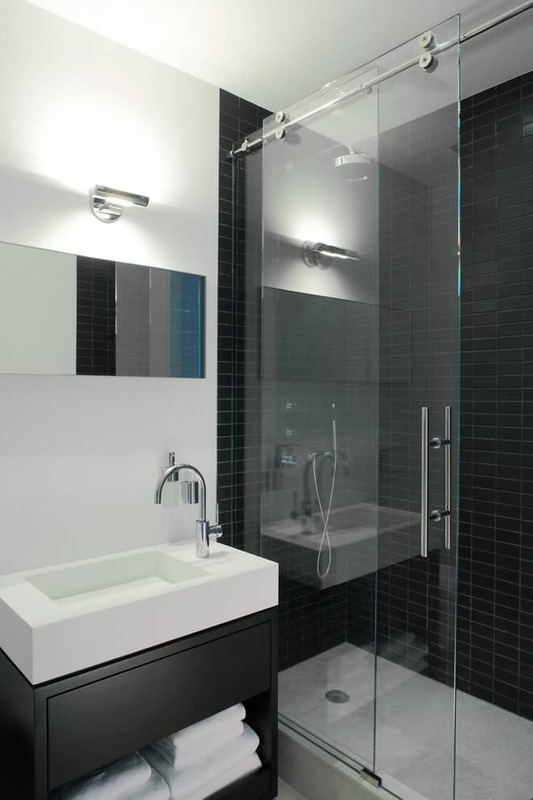 A smart architect or renovation contractor can set your walk-in shower in one corner of the small bathroom. You could also neo-angle this space to create more surface area inside the walk-in shower. Smart decorating ideas like adding a marble doorway to the walk-in shower can add a huge visual impact, taking away attention from the small bathroom. 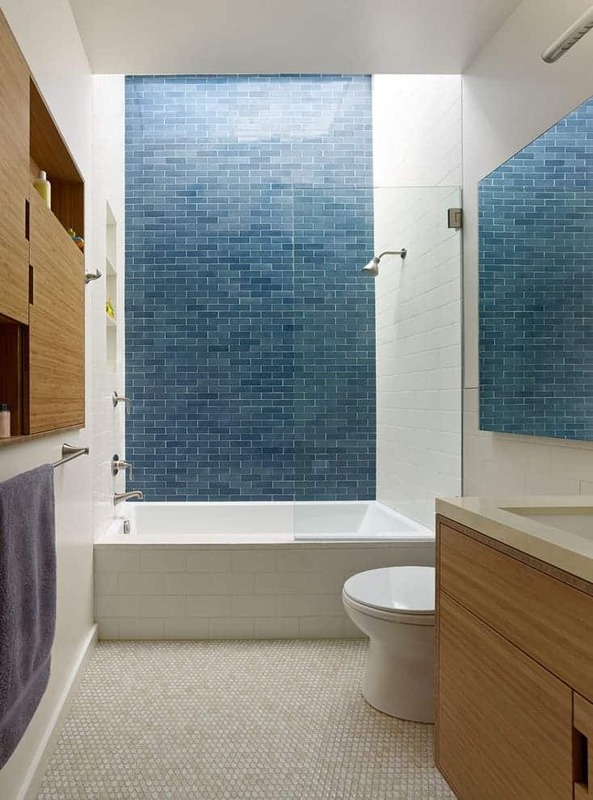 The area inside and outside the shower can be visually linked using the same tiles and flooring. This creates a continuous visual link to make the bathroom roomier. 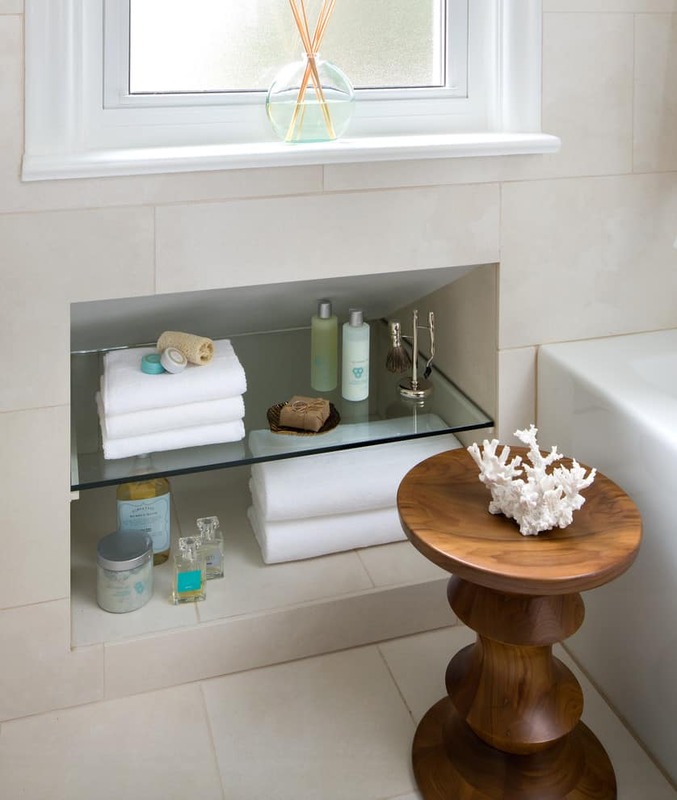 A corner pedestal sink is the best way to prevent crowding of a small bathroom. This way, the basin won’t get in the way of the door opening and closing. A floating vanity with sink also makes the room look bigger than it is. Always use rounded sinks in small spaces! Tight corners not only hurt your hips, but they also tend to take up more space in the cramped area. 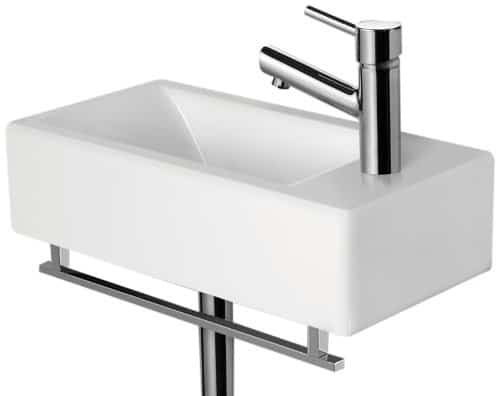 One of the trendier small bathroom fittings is a trough sink. It can be wall mounted to free up precious floor space. You can also have a small storage underneath this to keep things minimalist and clean. If you have a plumber or some plumbing expertise, having your faucet mounted to the wall, rather then on a vanity can free up lots of counter space around your sink. 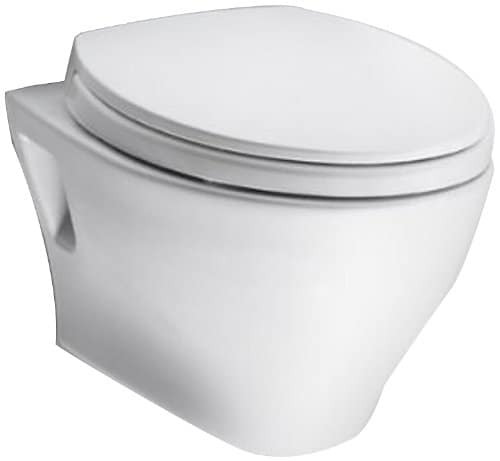 Elongated or oval-shaped bowls may be more comfortable to sit on, but when it comes to small toilet ideas to maximize space, it is better to go with rounded bowls. 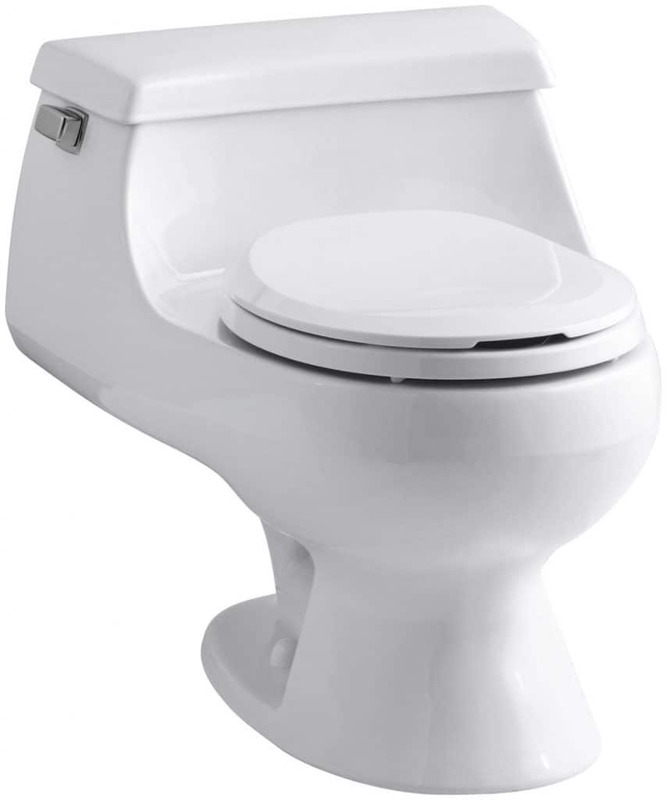 You can also try a one-piece toilet where the bowl and tank are fused together to save space. These can create a sleek and stylish look. 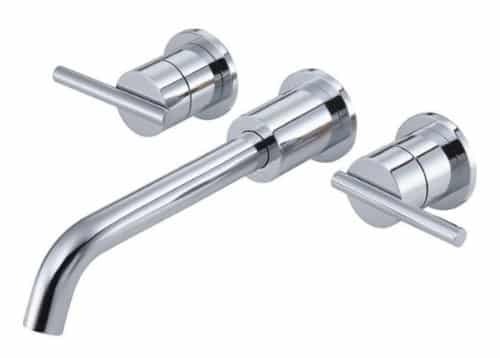 Wall mounted toilets are some other small bathroom fittings that allow you to clean underneath and also free up floor space. If you are really hard up for space, then check out this Japanese toilet and sink all in one. It’s super gross, but you definitely save some space. Depending on the space available, focus on keeping only the accessories that you need you really need the most. 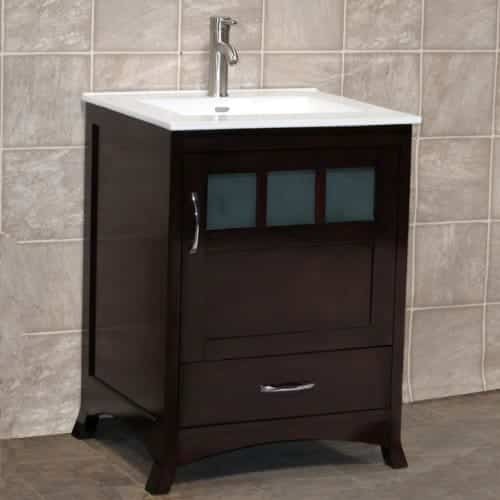 These include towel racks, sinks, mirror, and cabinets. Once your primary accessories are taken care of, then you can focus on non-essentials, like soap holders, bottles, toothbrush holders, shower curtains, etc. Select your accessories, so they march the overall color scheme and décor. Depending on the space available, you also might want to add some decorative vases, frames, candle holders, etc. A Small Bathroom Makeover can be a benefit to your Budget! 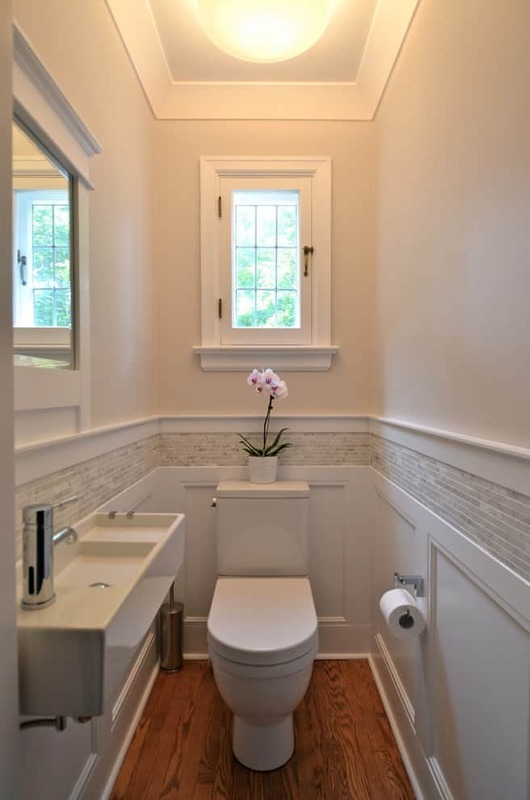 The up-side of working with small bathroom designs is that you can control your budget since there’s not much you can do with a small room. But with a limited space, and if the budget isn’t so much of a concern, you can splurge on high-end fittings and small bathroom vanities instead. 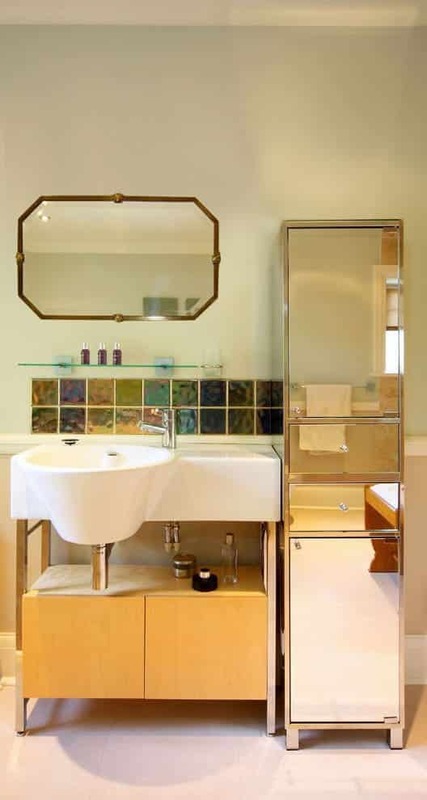 Above all, your bathroom has to be functional, which means that before you even start thinking of buying small bathroom vanities or talking to anyone about small bathroom tiles, make sure your plumbing is in excellent working condition. Any leaks or squeaky sounds should be fixed. Otherwise, you could be wasting money and time if the problems cause or lead to water damage and repairs – starting this whole process over again. 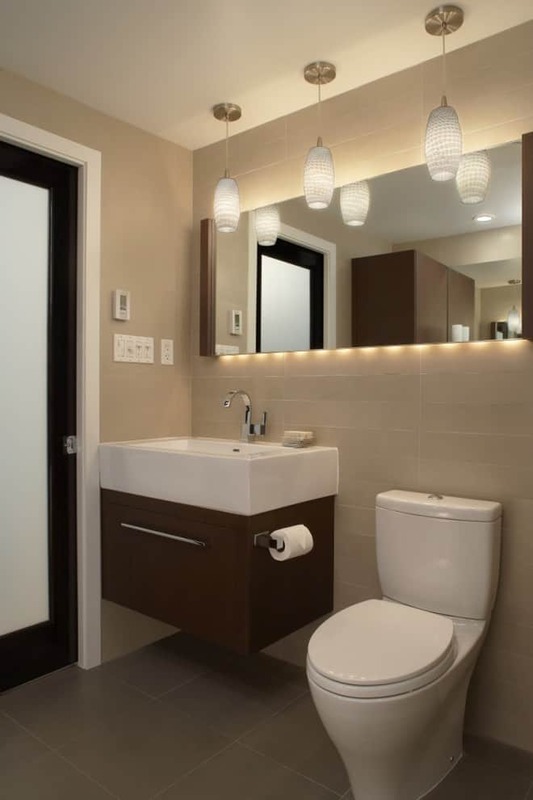 From shopping for small bathroom flooring to hunting down small bathroom sinks, transforming your tiny bathroom into a haven is no easy task, but it is gratifying once you accomplish it and are happy with the results. The long-term satisfaction with your small bathroom space is only possible if you avoid adding more clutter as the months go by. Essentially, you only need a few items to enjoy your bathroom: a mat, bath and hand soap, shampoo, bath and hand towel, trash can, toilet paper, and water. Everything else can be kept elsewhere… like all your medicine, make-up, cleaning agents and tools, styling accessories, clothes, hamper, supplies, magazines, books, newspaper, mobile phone … do you get the idea? A small bathroom is a blessing because it isn’t an outhouse. If you have never experienced living with an outhouse, talk to your grandparents or look up the horrors of bathing in an outhouse. The fact that you can renovate implies that you have control over that space and that’s also an essential fact to take away with you as you plan your renovation. Confucius says, (actually the Décor Snob says) a bathroom is only as small as your mind makes it to be. Right now, you have a fantastic opportunity to do something unique and mind-blowing that will inspire and uplift your spirits every time you use the bathroom. I’ll be sure to cover more small bathroom space saving ideas in future articles. If there’s anything you really want to know about or have some question about anything I mentioned here, PLEASE leave a comment below. Thank you! I absolutely LOVE your ideas! Will certainly bear them in mind when I get my small flat. THANK YOU. I just happened across this article — very helpful advice, especially for getting it all to work together. I will be following you. Thank you so much for sharing this post with us, It’s very informative for me!! Ideas are really great. It helped me a lot. This sure was delightful to read. Seeing how many you could do with your bathroom to keep it tidy and always looking neat is something of an everyday chore so be sure to commit and find bathroom pieces that go well together so cleaning up wouldn’t be that bad. I am so excited to find this fantastic blog to solve my problem. Such an informative post you share that give me a plenty of information repair my instant problem. I appreciate your hard work.